Tactic: Use layers of filters to find donors who are not giving at their full capacity. Start with a list of LYBUNTs and search for your previous fiscal year. Then add a “Gift Amount” filter, looking for donations at a certain level (say $1-250). 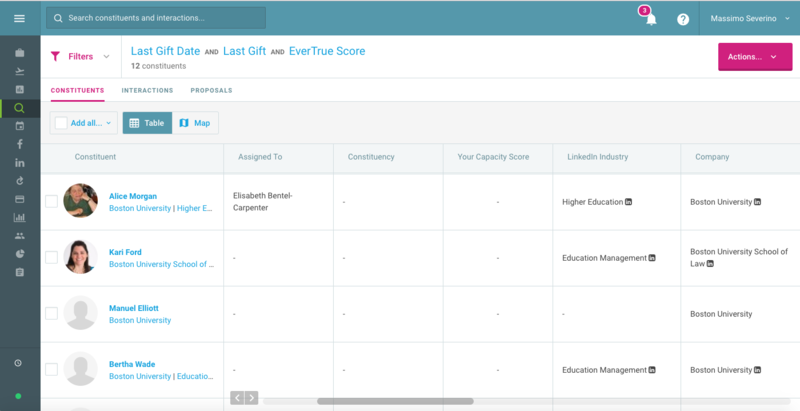 Finally, add another filter of your own capacity rating or EverTrue’s proprietary annual giving score to generate a list of donors who gave below their capacity. Bonus: You can narrow this list even further by adding a filter of “ Last Facebook Engagement Date” to prioritize outreach to donors who have recently interacted with your institution online. Results: Help move donors up the giving pyramid by leveraging key data points to lead to strategic outreach.